I’m joined in assembling this post by Kirk Paulsen, who took the photos within and contributed many great ideas. It’s October, or as your local walking advocacy group Oregon Walks has branded it for the last two years, “Walktober.” I agree wholeheartedly with the sentiment—there really isn’t a better time to go for a stroll than right now, at the peak of the spectacular northwestern autumn. Of course, life in the motor vehicle age means that one cannot walk far in the city without soon needing a path across the vehicular part of the road. 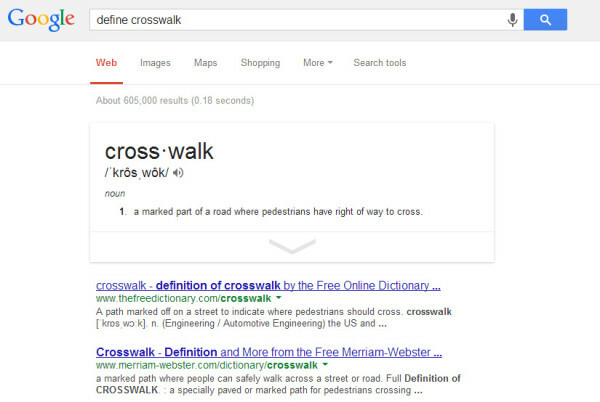 Hence, crosswalks. Playing the role of the forgettable sidekick to sidewalks, they’re an underappreciated part of the pedestrian infrastructure—the part of the walking trip that is to merely be tolerated, not enjoyed. In turn, crosswalks have come to be one of the most misunderstood pieces of transportation infrastructure. None of these things are what a crosswalk is. In celebration of Walktober, we thought it might be fun and worthwhile to take a tour of Portland’s crosswalks, looking at the relationships between location, treatment, and quality. 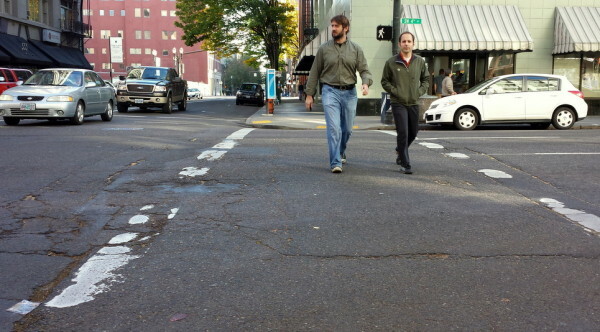 Click through to be whisked away to the best crosswalk in Portland, where we’ll start. This is, to me, the ideal crosswalk. 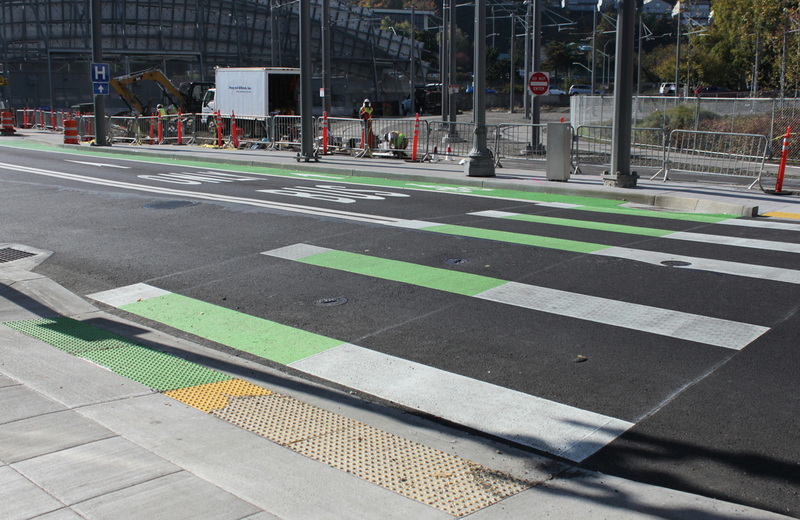 Three design features combine to make this crosswalk excellent. 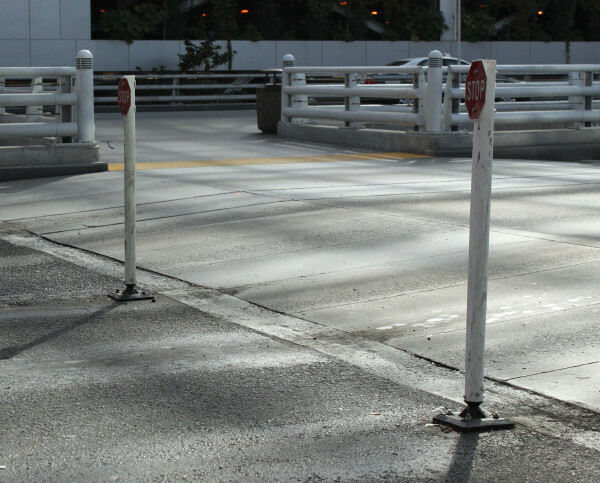 First, it’s raised to sidewalk level, physically limiting the speeds of vehicles crossing it and making it especially comfortable for disabled pedestrians. Second, it’s paved like the adjoining sidewalk rather than the street, so as to have the ‘feel’ of a walking environment; this is especially true when combined with the fact that it’s raised, and it’s pretty wide to boot. Finally, the stop sign bollards between each lane are unambiguous and unmissable. In fact, their presence means drivers must always stop before entering; without them drivers would only need to stop when a pedestrian is crossing (or showing intent to do so). These two crosswalks are located on SW 4th Avenue connecting the Portland State Engineering Building to numerous food carts directly across the street in addition to many other destinations on campus. Just a few hundred feet to the south of here, Barbur Boulevard and an I-405 exit combine to become 4th Avenue, and traffic that catches the green light at Lincoln is often humming along at Barbur-like speeds when it arrives at this suddenly bustling beginning of downtown. The Continental-style [cheat sheet] striping is helpful, but doesn’t do nearly enough to address all of the realities at this intersection. Forcing drivers to slow by way of raising one or both of these crosswalks would be a good way to communicate the changed nature and purpose of the street, and putting some signage in the roadway—the tall, thin “stop for pedestrians within crosswalk” sign would be a good alternative to the full stop—would protect against the “triple threat” of three lanes of traffic. You’ll slow some buses and emergency vehicles at this location, but the demand for this crosswalk is enormous—people cross continually for most of the day—so it’s a tradeoff worth considering. This is known as a “rectangular rapid flash beacon,” where a push-button activates the (often solar-powered) LED’s. While they don’t self-enforce like a raised crosswalk, these seem to be pretty effective treatments, and might even be the better solution where demand is irregular. The research is continually finding good if not great yielding compliance, and the flashing is appropriately obnoxious and thus hard to miss (provided you’re approaching it at a reasonably direct angle). Additionally, activating the beacon shows clear intent to cross, removing the ambiguity that’s a common lament for drivers. Less common but similar approaches include illuminating the edges of the crosswalk sign itself, or illuminating lights within the roadway at the ends of the crosswalk. One thing that we’re not quite expert at yet is leveraging the naturally complementary aspects of cycling infrastructure and walking infrastructure to benefit both. This particular installation could be improved by routing the bike lane behind the refuge island with the sign. This would shorten the crossing distance of the main part of the road by about 12 feet, and place the sign such that it would be directly in front of both oncoming bikes and motor vehicles to the greatest extent possible. And even though it would only be a short stretch of bikeway, physical separation of bike and auto modes is the holy grail of subjective safety for bicycles and it’d be nice to see it included in designs wherever possible. 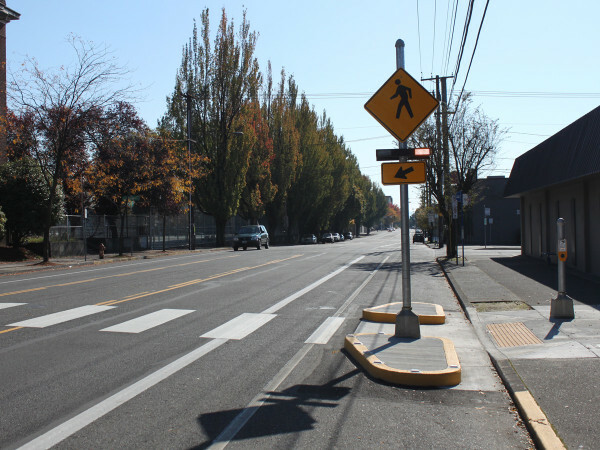 The new bit of neat cycle infrastructure along SW Lincoln Street junctions with the left-side bike lane along SW 5th Avenue, which then crosses 5th at this cool-looking crossing treatment. Every mode has its own signal here—5th has traditional signals for the vehicles (and a MAX signal to boot), while the minor approach has bike and ped signals but no auto signal. This reminds me a bit of the Toucan, born in Britain and Americanized in Tucson, although this installation is slightly different in function. Before the construction of all these goodies in conjunction with the PMLR, this intersection was much more unwelcoming to bikes and pedestrians, but by providing them dedicated space among all the asphalt we’re inviting them back. This is certainly the minimalist approach to crosswalk marking, even before a winter’s worth of studded tires turns the markings into Morse code. This style of crosswalk seems to work well enough with signalization that there’s no real controversy around it. There’s even a school of thought that it’s safer than using a more substantial marking style, lest we make the walking environment so welcoming that the poor saps on foot start leaping into traffic to their demise. The trend, however, seems clearly in favor of using more significant crosswalk markings. As a driver, there’s a more uncomfortable feeling when you’re on a big splotch of paint without the right-of-way than when you’re on a splotch of asphalt between two fast-eroding stripes without it. It’s more uncomfortable, then, to pull into a crosswalk to try to turn right on red, or to “block the box” in gridlock. The pedestrian experience is accordingly more welcoming. 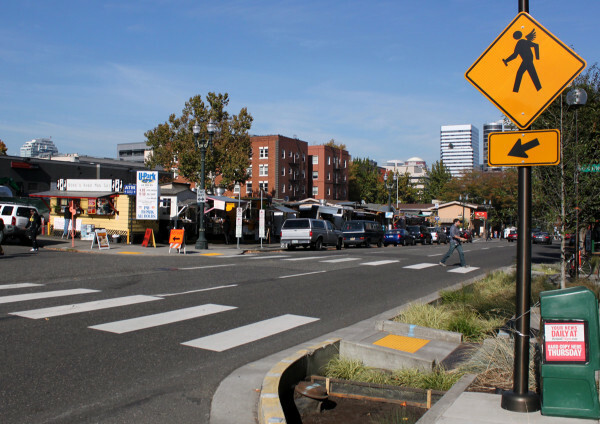 With the food carts to the north and shopping and offices to the south, there’s a ton of demand at the two crosswalks crossing Alder at SW 9th. The two travel lanes carry some of downtown’s heavier volumes since they provide a direct route to the Morrison Bridge, and though signal timing keeps speeds reasonably slow, vehicles are approaching at enough of a downhill grade that it adds a degree of intimidation. But the real badge of indignity for this crosswalk is earned by the fact that the visibility is terrible owing to the parking spaces where the crosswalk should be. Not surprisingly, when we fail to acknowledge a crosswalk’s existence, yielding behavior is pretty terrible. If you’re left with any lingering doubts about the public’s misunderstanding of unmarked crosswalks from the mere fact that Google has it wrong, you can put them to bed a few blocks to the south. The two crossings of Taylor Street along SW Park Avenue above are pretty much identical, except for the fact that the Continental markings were recently added to the eastern one while the western one remains unmarked; a similar configuration exists at the intersection of 9th and Taylor a block to the West. Since it’s conveniently located within eyesight of one of the best spots to enjoy a lunch in downtown—Director Park—it makes for an ideal spot to take a break from the stresses of the job and enjoy a relaxing session observing yielding compliance. You won’t get too far into your Khao Man Gai before realizing that compliance is better at the marked crosswalks than the unmarked ones. While the striping across Taylor probably does more in function, I’d be remiss if I didn’t give a nod to the crosswalk on the north side, which is marked in the same way as the crosswalk at the top that I’m so fond of: with sidewalk pavers. 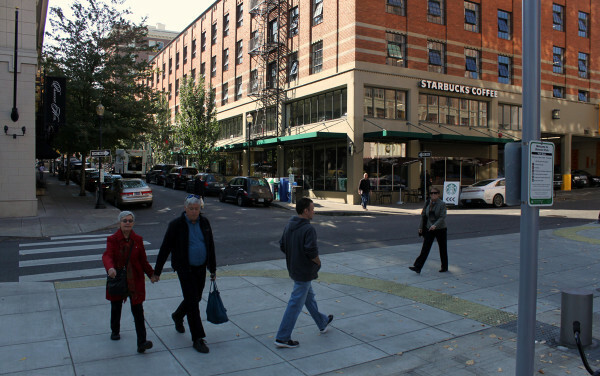 Add to it the 90-degree ramp and the woonerf-like street segment parallel to the park, and you’ve created a walking environment that has made Director Park the den to Pioneer Square’s living room. Not surprisingly, these tend to be found in areas with other features that are deleterious to the walking environment. Kirk snapped both photos above in close proximity to I-405. 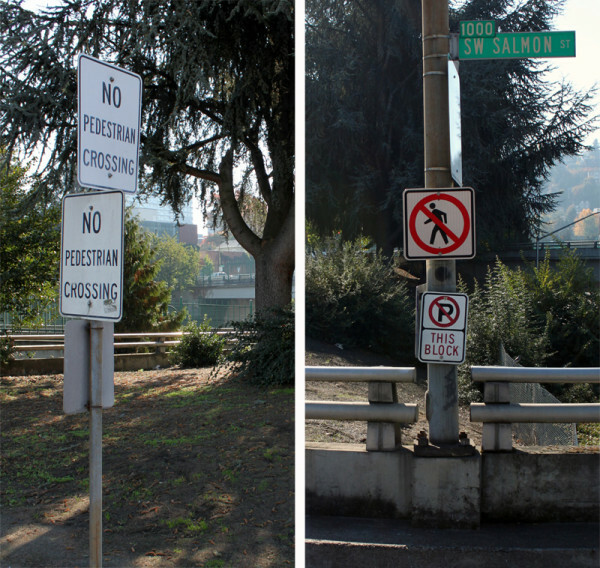 The presence of these signs usually means that the pedestrian is failed in some other way; most often, there are inadequate sidewalks on one or more ends of the prohibited crossing. A pedestrian commits the offense of failure to use pedestrian tunnel or overhead crossing if the pedestrian crosses a roadway other than by means of a pedestrian tunnel or overhead pedestrian crossing when a tunnel or overhead crossing serves the place where the pedestrian is crossing the roadway. Which is interesting, because this is exactly the case with my favorite crosswalks in the city. Did you figure out the location of our exemplar? 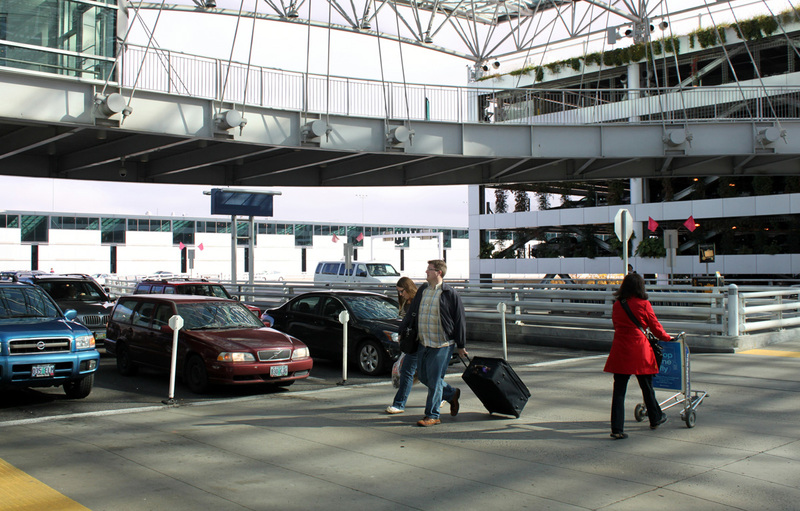 It’s at the Portland International Airport, one of several like it that runs between the terminal and the parking garage. Though the intent is clear, by the letter of the law it appears that this crosswalk isn’t a legal pedestrian path to the parking garage as the overhead crossing negates the need for it. Fret not, however. You can still legally use it to cross to the island where you access shuttles to Parking Lots A through D.
Perhaps one day we’ll build a crosswalk this nice that leads to something other than parking. Did we forget any noteworthy crosswalks? Want to share some of your favorites? Keep the conversation going by joining us for our walk this (Monday) evening. Brian Davis is a Transportation Analyst for Lancaster Engineering, where he works on a range of projects including transportation impact studies, transportation demand management plans, traffic signal design, and active transportation projects. He is an alumnus of Portland State University's Transportation Engineering program, where his research focused on sustainable urban freight transport. When not engaged in some manner of transportation wonkery, Brian enjoys cooking, collecting and drinking wine, and flashing some serious juggling moves. What’s the Impact of Hanjin’s Exit? Interesting post. 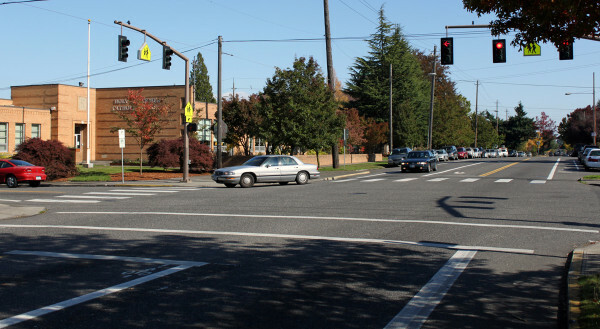 That intersection at SW 4th and College needed to be signalized a long time ago. Drivers approach that intersection too quickly coming from I-405/Barbur and I have seen plenty of instances of non-compliance. A signal would make crossing safer for pedestrians and also meter the traffic flow entering downtown. The problems with crossing in this city are compounded by frequent sidewalk closures from building construction that force pedestrians to cross several times out of their way needlessly, because we can’t possibly close a parking lane or (dear heavens!) a travel lane for motorists. That 9th and Alder example you post is a crosswalk that pedestrians had to use for several months during the construction of CityTarget. In more civilized cities, we would remove a parking lane and construct a temporary, sheltered walkway for pedestrians to traverse. Yes! The sidewalk closures downtown definitely degrade the pedestrian environment–that’s been a pet peeve of mine for a while. Another example that I almost included was at SW Park and Salmon, where construction at The Picnic House on the northeast corner of the intersection diverts people crossing away from the marked crossing on the east side onto the unmarked crossing on the west side. It’s about as well thought out as the ped detour accompanying the CityTarget construction you mention, which is to say, not at all thought out. I noticed the city put up “stop here for peds” signs and I think they’ve also painted white stopping lines, but I wonder if there are other best practices for this type of crossing treatment? Nice tour. All the new striping in the Lloyd District really helped me appreciate that the deign of this striping is a vocabulary for peds, bikes and drivers to learn. Given how inconsistently this “vocabulary” is applied around Portand must surely explains some of why motorists have trouble knowing what to do. I can’t help but wonder if having lots of very prominently marked crosswalks makes drivers less likely to yield at unmarked intersections. Counter intuitively, pedestrians might be better with no marked crosswalks at all, to drive home the message that ANY intersection is an implied crosswalk. And, if the city held their Crosswalk enforcement actions at unmarked crosswalks most of the time, the message might be a little stronger. Instead, I only know of one instance where they did enforcement at an unmarked crosswalk (Belmont in front of Horse Brass).